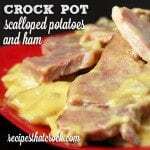 This Crock Pot Scalloped Potatoes and Ham recipe is a new family favorite. So easy and delicious! It is creamy and so delicious! I used my Hamilton Beach Programmable Insulated Slow Cooker for this recipe. It was a cinch to clean up (which is always a good thing when you are working with cheese!). Your favorite 5-6 quart slow cooker would work as well.